Wheellocks, the first guns that could be carried loaded and ready to fire, are expensive and require constant maintenance to prevent the mechanism from seizing up. (A major problem in a ship board environment.) 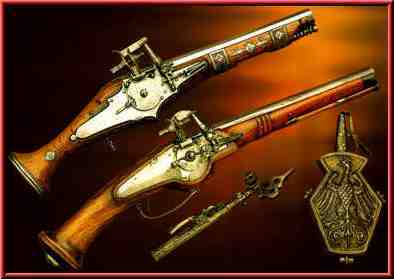 Still manufactured (though rarely) into the early 18th century, as expensive and ornate custom weapons, with many older ones still in service. Wheellocks use pyrite instead of flint. Even wheellocks that are not exposed to dampness and a ship board environments required considerable cleaning and maintenance due to the corrosive effect of black powder on the complex spring mechanism. Wheellocks were built into a variety of weapon types.